Specially designed for outdoor security street lighting, this solar powered light requires no wiring. Mounts in seconds. Auto turn-on and turn-off function can save your labor cost. Perfect for patios, decks, pathways, stairways, driveways, garden, etc. Soar powered: powered by sun energy. 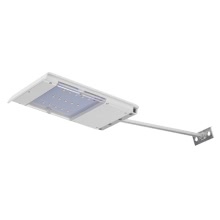 No any electricity cost, no electrical wiring required when install the light. Super bright with 15 LEDs, producing total 120lm, which is qualified to be an excellent outdoor security street light. Light control: automatically turn on at dusk and turn off at dawn. It will not light up in bright environment. Free maintenance: Turn on the light before installation. Then it will auto run to save the labor. IP55 water-resistant ensures the light can work in rainy and snow weather. Large battery capacity: 2200mAh battery capacity. Ensure the light to be mounted on some place where it can get enough sunlight. Water resistance means resistant of rain and snow. Do not put the light into water. It will become a little darker after working about 6-7 hours and will be dark after 10 hours gradually.